Ignis is a branch brand of Albion. VQ is the most high line for Ignis, and the price zone is the mid of the Infinesse and Excia AL. Ignis changed the formula of Ignis VQ Glorious Milk to Ignis VQ Glorious Milk EX in SS2017. I got some samples of this new Ignis VQ Milk EX. Albion/ Ignis method is the same and unique: Milk first, lotion second. Third is something (creams or oils etc…) wrapping your face. Albion (and their bunch) recommend to use milks by cottons. It is because surface area, and also means removing your dirt on your face what you could not remove by your face wash. In person, I like applying their milks by my hands 🙂 I dislike cosmetics are sinking to cottons really quickly. I had tested to write comparing articles, this VQ was really quick to be sinked. This is just my preference, and not there are big reasons. But I recommend to “hand press”, aka wrapping your face by warm hands after applying. If you are a royal audience of my review, you may know I hate artificial perfumes, but I LOVE herbal scent. I know Albion skin care products well. You can see how I had reviewed. And I KNOW the quality, indeed there is one HUGE problem for me. Yes, perfume. In Albion brand, Excia AL is “acceptable”, Exage is “not for me”, Infinesse is “dislike”. I know the perfume of Ignis is much better than Albion brands. This perfume is a kind of herbal, aww, I just imaged medicated western herbals what is good image for me, in person. I know this perfume is rising this price higher, but I accept it. I am believing “feeling” of comfort is also important factor of skin care. My skin is combination: oilier and super dry :(( I need water and oil on my “desert” zone of cheeks. I feel this emulsion made my face be moisturised with the oil. When my skin is fine, I never feel anything irritation, but when my skin is super damaged, I feel sting by VQ line. It is not only by VQ line, but also water too. According to Ignis, this milk has brightening effect, and some Japanese reviewers are saying their dull skins are glowing with this new VQ milk. For me… I have a red and uneven part on my cheek, it was left by the super bad condition in this Spring 🙁 It is scaring me to image it is tuning to a dull or a big freckle. After I had done with this small tube, this red is still on my cheek, but I also need to say the shade is coming to even. Excia AL Whitening Rich Milk SV is my favourite, what is lighter of Excia White Milks. Both of the milks are “brightening” milks. It is the VitaminC the ingredients for the brightening in VQ, and it is Tranexamic acid in Excia Whitening Milk. This is the reason why I repeat Excia. According to the BC of Albion, Ignis VQ is quicker than make your face look bright, but if you want to resolve (in sunny countries like in Japan, tanned skin is “problem”), she recommends to use Excia Whitening Milk. Let me compare these two. You may see the difference significantly, the VQ EX is runny texture. Yeah, I am using whole of the cotton for one side of the face each, totally I use double of the quantity 😀 Because my skin is a little bit tired, and I need to pour something 🙂 You can change the quantity as you want, and when my skin is well, I use 1-2 pushes for whole of my face. Just attention. I am a repeater of Excia AL Milks, and in Whitening Milks, you will get something white residue if you do not set your face well. Fortunately, there are no sting for both of the sides. 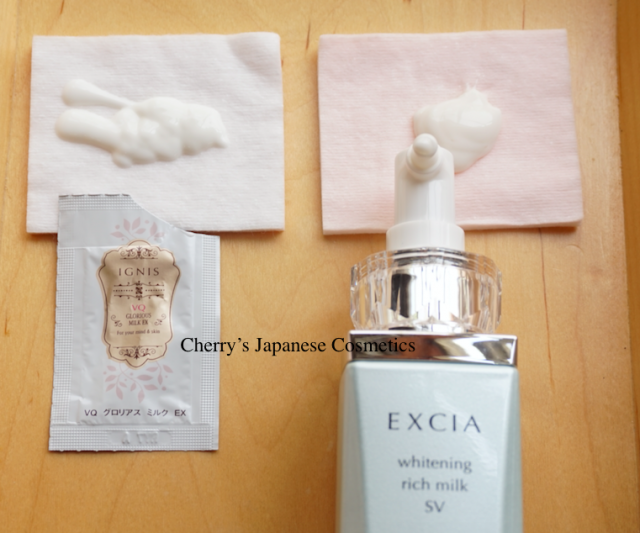 When my skin is really damaged, I feel pain with using Excia Milks. Ignis VQ is runny, but Albion milks are oilier. If you are an oil prone, please keep your foots away from the maker of Albion. I am feeling both made my skin well moisturized, and smooth. However Excia is more oilier than VQ. I say again. VQ is also OILY products. And I did not feel my face of VQ side is significantly brighter than Excia side. I like the herbal perfume of VQ more than Excia. But I kept repeating Excia AL Whitening line, it is only for the ingredients. There are no sting in the both, but please attention if you have so sensitive skin, or damaged. VQ is less oilier than Excia White Rich Milk, it is not meaning VQ is not oily. VQ is also oily.